But in January 2012, he caught a head cold that soon progressed to flu then full-blown pneumonia. “My general practitioner looked at my chest X-ray and said it was one of the worst cases of pneumonia he’d ever seen,” recalls Nesbitt. He started a heavy-duty course of antibiotics and was ordered to rest, but just couldn’t seem to shake the respiratory symptoms. “Eventually, it became so hard to breathe that I checked myself into the hospital,” says the 48-year-old Clifton resident. A CT scan revealed the underlying source of his problem: a large mass in his right lung. He was immediately transferred to UC Health University Hospital’sMedical Intensive Care Unit, where he was stabilized and then began chemotherapy treatment for stage-4 lung cancer with medical oncologist Nagla Karim, MD. The tumor was pressing against his bronchial tubes, making it both difficult to breathe and expel the mucous clogging his lungs. At the peak of his illness, he required 15 liters of oxygen an hour. “By my third chemotherapy treatment, I was able to breathe completely without the oxygen mask. It was such an amazing feeling,” Nesbitt recalls. The aggressive chemotherapy regimen had shrunk his tumor to two thirds of its original size. He was transferred to Drake Centerwhere physical therapists, nurses and respiratory specialists worked with him to rebuild his physical strength and pulmonary function. After 30 days in the long-term rehabilitation hospital, he was overjoyed to head home. It’s been a long road to recovery—and he is still on it—but Nesbitt says he’s thankful for his renewed life. He will have regular imaging tests moving forward to monitor the tumor for potential new growth, and is rebuilding his strength day by day. For now, he is enjoying the ability to do basic things again—working part time, grocery shopping, cooking and hanging out with his cat. He’s looking forward to swimming this summer and returning to his volunteer work with church and animal rescue groups. According to the Centers for Disease Control and Prevention (CDC), an estimated 45.3 million people (19.3 percent) of all U.S. adults aged 18 years or older smoke cigarettes. The habit is more common among men, but is the leading cause of preventable death in both genders. 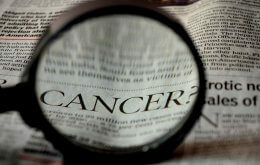 Lung cancer is diagnosed in more than 208,000 people in the United States annually. Tristate residents have higher-than-average rates of lung cancer as compared with the national rate of 61.5 per 100,000 people—Ohio is 70.3, Kentucky is 99.3 and Indiana is 75.7. To learn more about the UC Health multidisciplinary lung cancer team, visit cancer.uc.edu. Appointments with thoracic surgery can be made by calling 513-475-8787. Hematology oncology can be reached at 513-584-8500. To watch a video about lung cancer, smoking and secondhand smoke facts, click here. To learn about the dangers of secondhand smoke, click here. Media Contact: Amanda Harper, 513-558-4657 Patient Info: Appointments with thoracic surgery can be made by calling 513-475-8787. Hematology oncology can be reached at 513-584-8500.